The stock market rally has been remarkably durable so far, withstanding the banking crisis in Europe, the Brexit vote, natural disasters, terrorist attacks, periods of disappointing growth in the U.S., and the polarizing U.S. presidential election. Crossing the 20,000 threshold isn't significant in itself. It's simply a number. But it's a round one with all those juicy zeroes. So let's take a moment to examine why stocks have done so well in recent years, why the Dow is an imperfect proxy for the market and why the bull market hasn't changed the economic fortunes of most Americans. Over the long term — meaning decades or even a century — stocks are by far the best-performing financial asset. Adjusted for inflation, stocks have returned an average of 7 percent a year. That's better than bonds and far preferable to stashing money in a savings account or under a mattress. But in 2009, the depths of the financial crisis, the stock market was a terrifying spectacle, a place where money went up in flames. After topping 10,000 for the first time in in 1999, the Dow plunged to 6,547 on March 9, 2009. Fear permeated markets everywhere. It seemed plausible that the banking system might never recover, putting financial capitalism at mortal risk. Almost no one wanted to be in the market. But by then, the seeds of recovery had already been planted. The TARP rescue, whatever its faults, stabilized the banking system. And the Federal Reserve had put in place an extraordinary policy — keeping interest rates near zero — that ultimately made stocks extremely attractive. The basic idea behind the Fed policy was simple. If the interest rate you get on safe assets such as bonds is essentially zero — who wants that? — investors will eventually put their money back into real estate and stocks. And that's exactly what has happened. The great stock market rally roughly coincides with the Fed's near-zero policy, which has been in place since 2008. At the same time, corporate profits have come storming back since the financial crisis, and company earnings are closely correlated to stock market performance. So if you want to understand Dow 20,000 — the Fed and corporate balance sheets are the best place to start. The Dow isn't the entire stock market. Not even close. It's a weighted average of just 30 major stocks, including Exxon Mobil, General Electric, Apple and Wal-Mart. Financial professionals pay closer attention to broader indexes such as the S&P 500 or the Russell 2,000. But for much of the media and in everyday conversation, the Dow is often the default, the old standby, cited by force of habit. It's even used as shorthand for how the market is doing. That's a mistake. Because it only represents the fortunes of 30 big companies, the Dow doesn't tell an investor anything about the world of startups or the midsize firms that employ so many Americans. The Dow doesn't include Facebook, Amazon or Google's parent company, Alphabet. 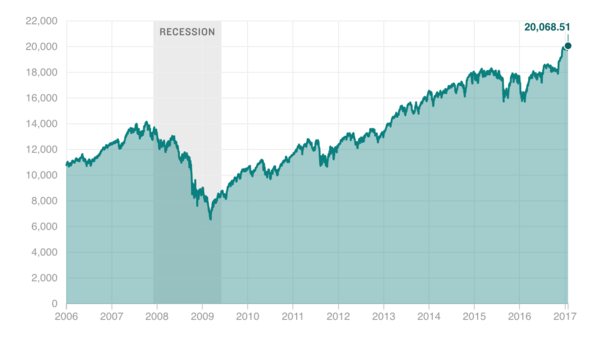 The stock market has recovered a lot better from the financial crisis than the overall economy. Economic growth has been sluggish since the Great Recession, averaging only about 2 percent. Wages have been stagnant. But the stock market has yielded handsome returns, benefiting institutional investors and households with the means to invest in stocks. All this has contributed to the growing disparities between affluent Americans and everyone else. For those who have maxed out contributions to 401(k)s or socked away money in a brokerage account, the stock market has been a godsend. But only 52 percent of Americans have money in the stock market, matching the lowest rate in 19 years, according to a Gallup Poll from April. In 2007, according to that same poll, 65 percent reported investing in the market. Based on those Gallup numbers, many Americans lost faith in the market at exactly the wrong time — just as it was staging a powerful comeback. Another discouraging side note: The stock market rally could be sweetening the retirement portfolios of ordinary Americans. But those portfolios tend to be skimpy, meaning ordinary investors don't get much bang from their stock market bucks. In 2015, the median balance in retirement accounts was just $26,405, according to Vanguard, one of the largest managers of retirement plans. What about that crazy election? The stock market was jittery in the days immediately before the election. And according to research by two prominent economists, the market dipped when Donald Trump's election prospects improved in betting markets. They even predicted that the S&P 500 would be 12 percent lower with a Trump victory than a Clinton win. And for a few hours after Trump clinched the presidency, stock market futures plunged, falling by as much as 5 percent. But prices quickly recovered, and the market has enjoyed an unanticipated Trump rally that began Nov. 9, the day after his victory. It's impossible to pinpoint a single reason for the post-election bounce. Some analysts point to Trump's promises to spend big on infrastructure and cut taxes, moves that could juice the economy. Trick question. Only fools say they can predict where the stock market is going. What is known is that a single event can trigger a stock market sell-off — like a military confrontation, a bank failure or a big jump in oil prices. But this market rally has withstood many unsettling events. So who knows?